Hit-and-run air strikers that pester their prey. While their tactics are sound, why do they stop to gloat every time they land a hit? 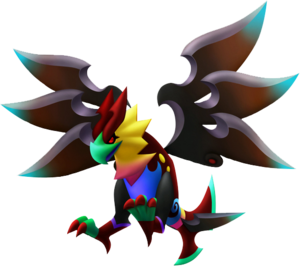 The Halbird is a Dream Eater that appears in Kingdom Hearts 3D: Dream Drop Distance. The Halbird is a brown, eagle-like creature. Its wings and tail look like blades. 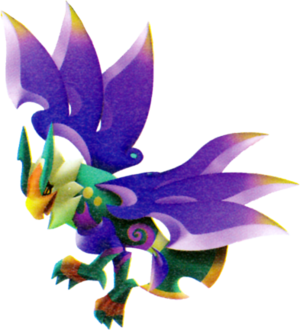 The Dream Eater's beak, legs, and tail are outlined in aquamarine. Its eyes, "horns," body, tail, upper legs, and claws are red. The fur on its neck is yellow, and its chest is blue. 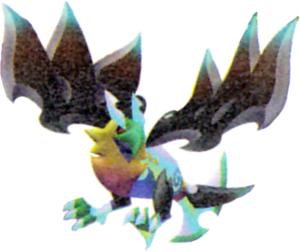 The Halbird's English name is a portmanteau of "bird" and "halberd." In the Japanese name, ナル (Naru) is an abbreviation for narcissist, so its name would mean "narcissist bird." ↑ 1.0 1.1 Becomes available when in Harrier disposition. ↑ 2.0 2.1 2.2 2.3 2.4 Available after unlocking Secret: Green at E-5. ↑ 3.0 3.1 Becomes available when in Sky Master disposition. Sora can obtain the Halbird Recipe from the second Special Portal in Country of the Musketeers. The Halbird can be created through five different recipes. The first recipe is a rank D recipe that has a 40% chance of transforming from Iceguin Ace. The third recipe is a rank C recipe that has a 20% chance of transforming from Eaglider. The fourth recipe is a rank C recipe.